This is a crass advertisement disguised as a blog post. But I figure that’s okay because there is plenty of drivel out there disguised as political discourse. If you’re like me, you cannot even stand to watch the talking heads on cable TV anymore — the token left-winger screaming at the token right-winger is supposed to make us all believe that some serious discussion is taking place, but in reality its just noise aimed at improving ratings. We face some serious issues in this country right now, but no one is talking about them in the media. Or if they are, I certainly couldn’t find them, so I had to create my own source for these discussions. This month marks 236 years since Thomas Paine published his pamphlet Common Sense, which went on to become the most widely circulated book in American history. 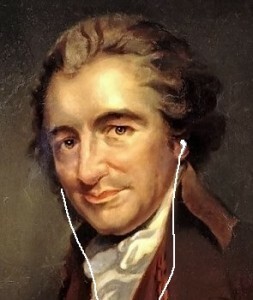 In a country that had become severely divided over the biggest issues of the day, including whether or not to seek our independence from Great Britain, Paine’s eloquent but approachable writing style tipped the scales in favor of revolution, and changed the history of the world. It did what other media of the day failed to do: cut through the noise and address the issues head-on, in words that every individual could understand and appreciate. Amidst all of our modern technology today, a medium that speaks to only one person at a time might seem quaint. But where the pamphlet triumphed in the 18th Century, being cheap and easy to produce, simple to consume, and even simpler to pass along to someone else, the modern day equivalent of the pamphlet, the podcast, is also triumphing over more traditional forms of broadcast media. A podcast represents an intimate discussion between the author and the listener, about topics of interest to both parties, free from the undue influences of advertisers and others with private agendas to promote. In its purest form, a podcast is a discussion about ideas. And as we all know from the humble pamphlet, ideas can change the world. The revolution will not be televised, but it will be podcasted. Thomas Paine was not the first person to publish a pamphlet, and I am not the first person to embrace the podcast as a way to promote ideas that I believe are valuable. But myself and a couple of fellow political junkies have grown tired of what passes for political discourse in this country. We are tired of being told that there are only two sides to every issue. So we started our own podcast to provide our own perspectives on the issues, and between the three of us, we offer a unique mix of opinions from the left, right, and beyond. So, if you’re tired of the TV pundits shouting at each other (and at you), why not take the opportunity to give us a listen? We promise we won’t shout. Hi. I did note years ago that I could identify Fox news without looking at the TV, or listening hard enough to hear the actual words. The voices were always raised, and often sounded arrogant and insulting. And when I focused on the words, I hurredly changed channels or turned the media off. But in fact with few exceptions the “liberal” and mostly not super right right wing media, are polite enough, and tend much more to address the issues. You are right, and very right, that the current political discourse is destructive of our nation, and, I think, of our very souls. I find most of the blame, however, to be one political party desperatly attempting to overwhelm truth with propaganda. Now don’t read that as excusing the less than blameless others. If the Republicans are nasty mean and good at passing out propaganda, it becomes both a weakness and a positive value that the Democrats are so crappy at it.